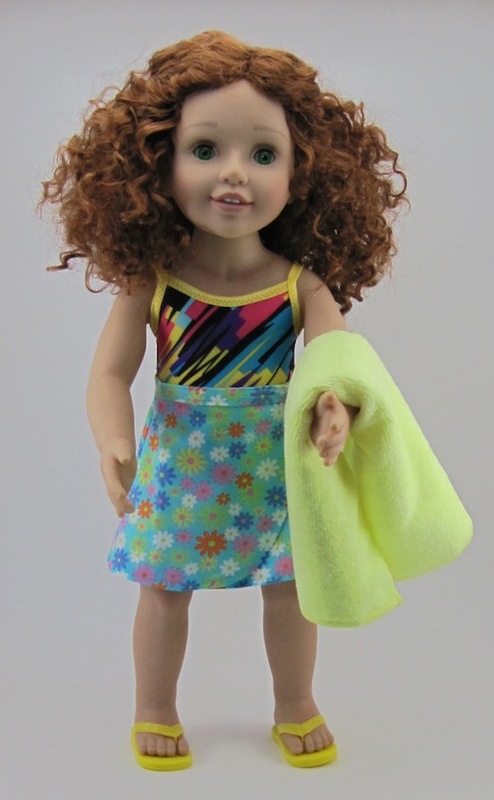 Hello...today I'm posting the bathers I've made for The Girls. Not that it's beach weather here at present!! We've had sooooo much rain in the last few weeks I feel like we're going to float away any minute! This is Jasmine modelling the first pair of bathers I made. These are for Emily and I made another pair in a pink version of the same lycra for Jasmine. They are a little short in the body for my liking....I didn't alter the pattern for these, so I decided to do some alterations and make some more. The little sandals are a pair that I made after watching Diane Morello's YouTube videos on how to make doll shoes.....she does awesome tutorials! Matilda is modelling the new version of the bathers pattern. I made the body longer and scooped the front neck a little. They fit much better now :) When I made the first pair I only had lingerie elastic in my stash to use on the openings. For these I used fold-over elastic that I bought from an Etsy shop. I couldn't source coloured fold-over in Aus, which was frustrating, so had some shipped to me. Now I have to make lots of things with fold-over elastic as I bought a nice collection of colours...should keep me going for quite some time! I also made a little wrap skirt, for a little modesty as Matilda goes walking around after her swim lol The "towel" is a microfibre cloth from a pack of 6 I bought at the Reject Shop. They are the perfect size for doll towels :) The little thongs are the ones that came with Matilda. All the Australian Girl dolls come with a pair.....aren't they the cutest things! I've also made a pair of bathers with hot pink edging, just haven't photo'd them. I am head over heels with the bathers!! OMG!, you sew like a pro!! (because you are!!) And the fabric is right on. Can you tell me the size of these Aussie Girls. The American's are 18 inches. I have truly fell in love with Matilda. My Granddaughter is so tall she is a head over everyone in her class. I am thinking it would be awesome to get her a Matilda for Christmas and then she would have a doll that is taller than all the others. See where I am going I want her to wear her height tall and proud. She is taller than most of the boys too (her dad is 6' 4"). 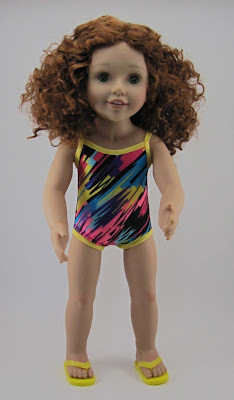 I think having a taller doll would be a great way to express celebrating the difference that make us, well us. Let me know when you can. Great job on the sewing I know Kate and Amy are going to have a grand time playing with all of these outfits. Please let us all know how they react when they get all their goodies. I really envy you're sewing abilities. I'm lucky to be able to do the most basic stuff much less alter a pattern. NOT!!!!! LOL The outfits are adorable and you've just got to love those cute little sandals. Hugs!